Wow, what a response to my info newsletter. Thank You! I have started a monthly newsletter for Jewelry Artists and Designers. Information about new rocks 4 sale and pertinent info, no baloney. Please note that at no time or for any reason will your email be used by or given to anyone else, ever, guaranteed! We have completed our transfer to a new host with great success, thank you GoDaddy! Great customer service, new features, better speed, we are happy again! Well, I finally bit the bullet and signed on with a new hosting service. My site is still down even though I was told after an hour plus on the phone that everything would be running today. It's one of those days when rather than dealing with it I should go fishing or just do something fun to remove the stress. I am quite convinced that I am being tested. Oh well, tomorrow is another day. I've got plenty of new rocks to post, turquoise, agates, more stones for the $4 and Down Gallery, but there's no point in posting that until the web site is up and running properly. Well, this is JUST GREAT! If you cannot get into GotRocks4Sale.com you call the 800 number and they tell you that the engineers are working on it. In the mean time I sit and wait. My traffic has gone done to practically nothing, sales are going on to those who have the web site cashed in their computer. This is just wrong. Yes I am ranting, my customers can't figure out what is going on, and there has been no communication from the company. The two kinds of cabochon edges that are most common. The example on the left is a cab with a dome that slopes right down to a sharp edge, and the one on the right shows a cab with a bezeled/flat edge. The flat edge is great for wire wrapping because it holds the wires that encircle the cab. This type of edge seems to be how the majority of cabs are cut, but I like the thin/sharp edge for beading. Many times the edge is rounded smooth, but if the cab has a good slope from the dome it will still work well for beading. Thanks Barbara, those who are new to beading bezels will find this information helpful. I know well that you aren't suppose to interfere with nature, however, when I can see a fatal ending coming I will step in. 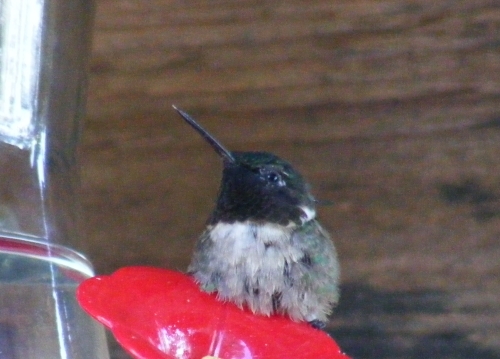 So, this is what happened; three days ago we saw this little hummingbird, and I mean little, sitting on the feeder. One wing straight up in the air, oh no, a broken wing? We all looked at each other, and walked away. It bothered me all night. 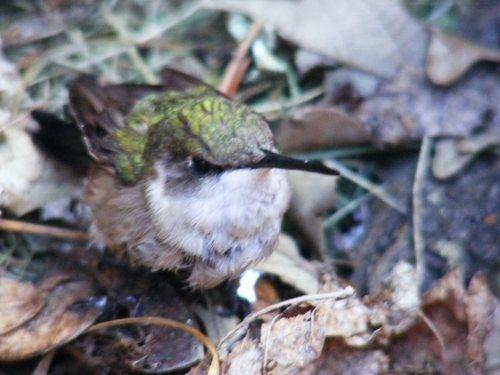 The next morning, day two, this little ball of ruffled feathers was sitting on the deck floor, hmmm, this is not good, Lou the cat will certainly interfere with nature, so I picked up this little girl and put her on the edge of a flower pot, in the shade. I thought about offering some nectar but I was on my way to town and really didn't have time. Day 3, I'm having coffee on the lower patio, located directly under the deck Harriet was first rescued from. I went in for a second cup, came out and was thinking what a beautiful day. I'd been feeding Kirby the chipmunk corn and sunflower seeds when I noticed out of the corner of my eye, a ball of feathers sitting on two very tiny little feet on the pavers. Oh my gosh, it was Harriet! Yes, I know I name everything. I scooped her up, ran up the hill to the deck and yelled for Linda. I wasn't sure what to do, but I had to do something. Harriet was so weak, she didn't have the strength to fly. 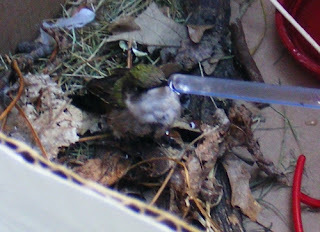 Linda grabbed a box and a feeder, a small cup and a toothpick. The feeder was just because we thought Harriet might know what it was for. We put some leaves, pine needles and a branch in the box. I dipped the toothpick in the nectar and offered it to Harriet and she licked it clean. Oh great I thought, now I need a straw, I knew that was the only thing handy. Harriet sucked that up like crazy, we did this every so often, hoping she would get hydrated enough to take off on her own. There wasn't a lid on the box, Harriet was free to fly away anytime she wanted to. The little bird was looking better and better. A few hours had passed and we saw another very young hummer sitting on the feeder. We then realized that Harriet had probably lost her way back to her nest. Henry sat on the feeder in the wrong place for a long time, then "slowly" flew to another feeder around another side of the house. As you can see the feathers are not completely matured. Henry was just getting his wings to work. I decided to move Harriet's box over by the main feeders so she could see and hear all the other humming birds. There are literally dozens of hummingbirds here. I watched for a while, hoping Harriet would fly up to the feeder, but no luck. I decided then to put her on the feeder, she hopped on my finger, I slowly raised her up and much to my delight, she took off for a big pine tree. Whoohoo, Harriet must have gotten enough juice in her to give her the energy she needed to fly. A happy ending for a great day!